Two days ago, a friend sent me a text, telling me that she met a woman who looks similar to me. She also added: "Maybe because I miss your jokes. The only different from you and the woman is just the nose"....and she ended the text with joke.com. To be honest, I don't see the jokes in her text - instead, I was thinking: "What is she trying to joke about?" Anyway, that's not the only experience I had with Indonesian jokes. Every so often I find their jokes are over-jokes. So what happened next if the jokes out-fix? it could become offended, right? 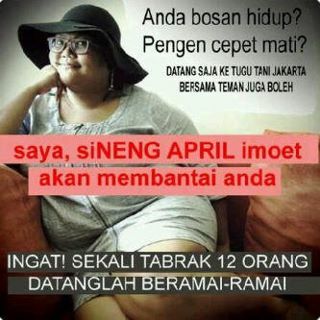 The thing is many Indonesian people don't really know how to joke. Here is one of recent black humour from Indonesia. I have no idea what inside the maker of this 'black-ads'. How can you make a joke from the very tragic accident which just happened not even 24 hours yet?! People are indeed mentally ill when they think they can make a joke in the name of other people tragic life!